A diet that is rich in lean and low-fat protein sources is a very effective way to slim down. Protein also helps you to recover faster between your workout sessions. This important macro nutrient is required for the building blocks for cells and tissues throughout the entire body. Every function of the body relies on protein. It is used for both building muscles and healing issues. However, you can’t just grab any kind of protein, certain types of protein, those that are lean, low-fat proteins…are the best ones to reach for. They have the biggest impact on weight loss. Body weight will also play a role in how much protein you actually need to feel satisfied and full. Heavier people will naturally need more protein than lighter ones. For the most part, for most individuals, 10 grams of protein per snack is plenty and about 25-40 grams per meal is sufficient. Not only is protein important in every meal you eat (there should be at least a palm size serving of protein with each meal consumed), but protein is equally important in your snacks. Try eating healthy nuts along with your fruit and vegetable choices when you snack. You’ll feel fuller longer and won’t be reaching for the next snack so soon. Protein rich foods are integral to a healthy diet…just make sure to choose those low in cholesterol and saturated fats. 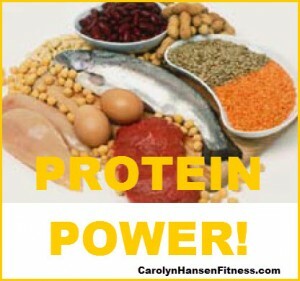 Healthy proteins maintain lean tissue, curb your appetite and burn fat for fuel. A total winning combination.